TORONTO, ON – High Park Brewery has announced the release of a new limited edition beer that has been brewed in honour of the annual cherry blossom festival in its namesake park. We wanted to create a unique and easy drinking lager to celebrate the spring cherry blossom festival in High Park and partnered with a Niagara cherry farmer to use locally grown cherries in our beer. The word ‘Sakura’ is Japanese for Cherry Blossom trees and there is a long-standing Japanese tradition, called ’Hanami’, of picnicking under these blooming trees and this is why we named our beer Under the Sakura. 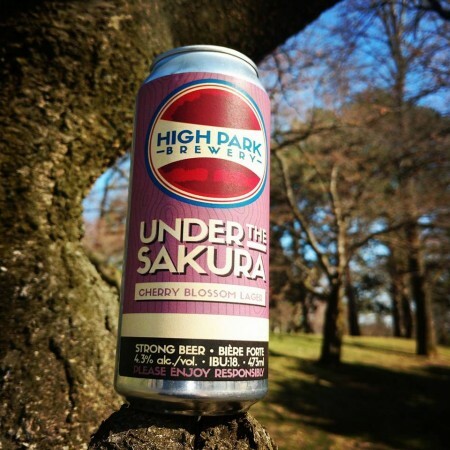 High Park Under the Sakura is available now at bars and restaurants in the High Park area.